The Cloisters—a branch of the Metropolitan Museum in Manhattan reassembled from five medieval monasteries in France—is a treasure trove of Christian art. The Cloisters was founded in 1933 thanks to a donation from J. Pierpont Morgan, who also contributed many of the original pieces in the collection. The museum has benefited from several other contributions over the years, including a number of medieval sculptures acquired by George Grey Barnard that were purchased through funding provided by John D. Rockefeller, Jr., according to the museum’s official history. The Cloisters features manuscripts, stained glass, paintings, and sculptures spanning the Carolingian, Ottonian, Romanesque, and Gothic periods, according to an official description. It contains over 5,000 pieces. Here are four must-see treasures. Completed by 1409 for John, Duke of Berry, this illuminated manuscript lives up to its name. According to the museum, “The richly illustrated text is enhanced by seven unprecedented picture cycles devoted to Christian figures or events that held special significance for the duke. Using a luminous palette, the artists blended an intimate Northern vision of nature with Italianate modes of figural articulation.” The book’s 172 illuminations are said to have influenced later masters like Jan van Eyck and other 15th-century Flemish painters. Carved out of Walrus ivory in the 1100s, this altar cross is “one of the masterpieces of Romanesque art, according to The Cloisters website. It contains 92 miniature figures and 98 inscriptions, including the Hebrew prophets and symbols of the four evangelists. The cross was originally used in the abbey at Bury St. Edmunds in Suffolk. Called a “technical tour de force,” this bust is the “only known terracotta sculpture from medieval Bohemia,” according to an official description. The virgin is wearing an ornate crown with her head tilted in an expression of “sorrowful resignation.” The piece dates back to the 1390s. 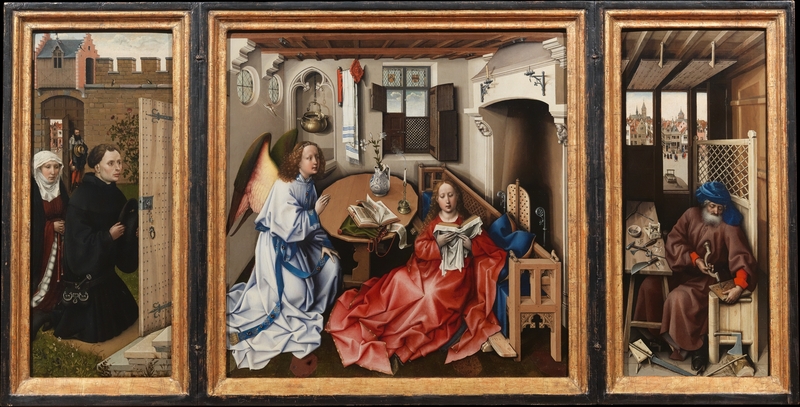 Also known as the Merode altarpiece after the family that owned it in the 19th century, this richly colored masterpiece was created by Flemish painter Robert Campin around 1425. At the center of the triptych is the angel Gabriel greeting Mary. At left are two benefactors of the art piece and at right is St. Joseph. The piece is packed with symbolism. On the table in front of Mary is a vase of lilies representing her purity. St. Joseph is making mousetraps—an image apparently inspired by St. Augustine’s description of the cross as the devil’s mousetrap.